The Adventures of Sherlock Holmes is a collection of twelve short stories by Arthur Conan Doyle, featuring his fictional detective Sherlock Holmes. It was first published on 14 October 1892; the individual stories had been serialised in The Strand Magazine between July 1891 and June 1892. The stories are related in first-person narrative from Watson's point of view. 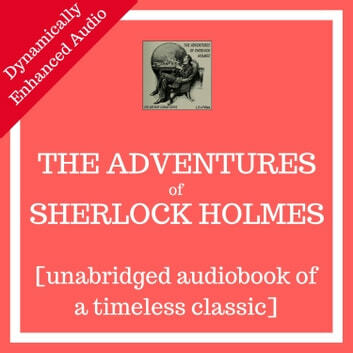 This audiobook is the most affordable version of the Adventures of Sherlock Holmes that also has high quality, masterfully engineered audio. All audio has an even volume level throughout the book. As necessary, it our practice to modify audio for your pleasure. We may use a computer-assisted dynamic-leveling process. Specific frequencies of narrators' voices can be boosted and/or compressed to maximize the clarity of the narrator’s speech. Noise-gate technology is often used to eliminate all background and room noise disturbances. Breakfast Time Media LLC, based in Richmond, Virginia, is dedicated to providing you with the best audio experience at the lowest possible price.